There are countless sandwich effects and variations, but they rarely go straight to the point. 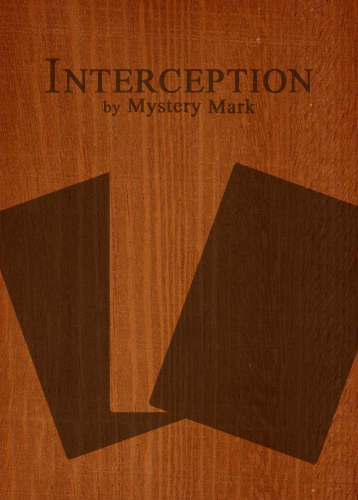 With Mystery Mark's 'Interception', a random selection gets buried in the middle of the deck and two preselected cards will instantly locate it or make it visually appear when waving them above the deck. It cannot get straighter to the point than this, and it can even be executed with multiple selections. All clean, all impromptu, all magical. This release is longer than most downloadable magic products on the internet. You may not like this but it is easy to skip to whatever part you are actually interested in. in the dvd mark teach how to do the controls ? It's not a DVD, but yes, I do indeed teach you everything in the downloadable. You didn't think that it's 1 hour and 35 minutes of performances, did you? Quite a big file but I really like you can choose for a high and a low quality and that there is a full table of contents. I have never seen that before. This download is incredibly thorough, indeed it was very easy to follow. And I believe you said its for intermediate/advanced magicians, and although I consider myself a beginner I don't think it will take very long to be able to perform it, with some practice of course! =) I doubt effects sold on ellusionist and t11 are that thorough, and they cost about the same! Well done, Mark! Can't wait for whatever the next release might be! This video includes precise and clear finger positioning for BOTH hands(for both right handed and left handed people). Many of the routines included make use of classic sleights, and Mark even goes into details for many of them, with quick, concise explanations of them, which by my opinion are taught better here than in ANY free YouTube tutorial. So not only are you getting Interception, but you also get the chance to improve many of your more basic sleights! Also, he covers additional ways to cover the moves to help with the angles. If anyone was on the fence about purchasing this download, I hope this will help sway your decision. Just two quick clarifications: 1) Is this angle-y at all, and if so where? 2) Is the selection of the cards completely free? 1) Is this angle-y at all, and if so where? It's not. I have actually performed this in surrounded situations. In the download, there is a section on the angles in which I teach you the necessary handlings and tweaks for that, and I go over the angles for pretty much all the sleights taught in the release so you shouldn't be facing any problem with it. Totally. You can even ask the spectator if they are sure about it and if they say no, you can keep on dribbling. can you tell me if palming is involved? No palming and no intense finger muscle usage, no worries, but.. you might be doing something wrong at the 'Bertram Shadow Change' if you use your finger muscle a lot. This may be because that wasn't a tutorial video, but an exposure video instead so it didn't go into the details. This however, goes into extreme details. Don't worry, you'll slowly get it over time! Just needs practice and your finger muscles will grow and be able to hold the packet with ease! Well said Travmang. It still surprises me how many moves genuinely ARE impossible on the first attempt, but that after practise the hand muscles actually adapt and are able to move in ways they simply were not able to before. Most one-handed cuts, the clipswitch, palming, coin rolls, etc. All of these felt impossible for me on the first few attempts but after a few days of occasional practice suddenly you wake up one morning, give it another go, and the bits that seemed tough are now flowing totally naturally. Muscle memory is the name of the game! Never give up on a move... Just keep trying it and your hands WILL make it easier for you given time.